• 85-90% of Muslims in the world are Sunni, 10-15% are Shia. 5) One Shia school - some break this into 5 or more smaller schools, but it’s not important here. 1) Faith - saying the 1st verse of the Koran 17 times as a part of daily prayers. 2) Praying 5 times daily. 3) Almsgiving or charity (zakat). 5)Pilgrimage to Mecca once in a lifetime for those who are able (hajj). • Muslims are encouraged worldwide to pray from the Koran in Arabic even though only around 15% are native speakers. “The world’s oldest university and Sunni Islam’s foremost seat of learning... Founded in 970~972 as a madrasa... In 1961 non-religious subjects were added to its curriculum”. "For over a thousand years, Al-Azhar has stood as a beacon of Islamic learning..."
The BBC called Al-Azhar’s Grand Sheikh “the highest spiritual authority for nearly a billion Sunni Muslims.” Kind of like as the Pope is to Catholics, and al-Azhar University is to the Vatican. Yet how it is possible that Al Azhar magazine “freely” promotes slaughter of Christians and infidels? 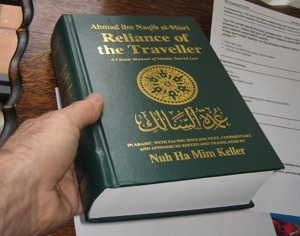 • Pictured below is a 14th century, 1200 page manual of Sunni jurisprudence, Reliance of the Traveler: Tools For The Worshipper, available free online and found in American mosques. I want to clear it as an expert reference to use later. That means you can take the credibility of this book to the bank. Watch this clip showing someone asking a question about this book at an “Interfaith Dialogue™” to see how that term is used deceptively about Islam in major American universities. “The 4 Sunni schools ... are identical in approximately 75% of their legal conclusions, while the remaining questions... differing viewpoints sometimes reflected in even a single school.” (page Vii). What these 75% identical opinions are on various aspects of sharia can be demonstrated with primary source documentary evidence. The other 25% are less clear. Some Experts™ would have you believe there are numerous opinions about certain things there is scholarly consensus on, but that’s one of the tricks used to confuse you. 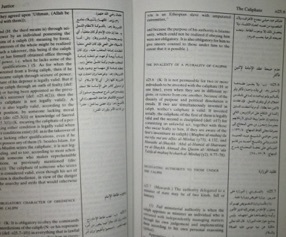 The degree to which certain aspects of sharia law have been enforced or ignored by various Muslim cultures over the centuries has varied, even on issues where there is scholarly consensus. Personal belief and practice of any religion may be different from what is actually taught.